The course is not intended to take the place of courses sponsored by FEMA, the National Hurricane Center, and/or state agencies. However, it will provide a good background for those who either plan to attend those courses or cannot attend them. The original module was published in 2000. This 2nd edition provides updated information on hurricane science and National Weather Service forecast products. 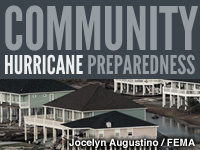 In addition, a new section on Emergency Management discusses decision-making tools that can help emergency managers in response and evacuation decision-making during hurricane threats. This module is course number IS-324.a in FEMA's Emergency Management Institute's Independent Study catalog. Excellent course for online instruction! I learned many new things! This course gave an overall of hurricanes and how they are formed, tracked and disseminated. Good primer on products available for emergency managers. Decision making section using various decision trees very useful. The lesson was fine the quiz part was not It made me doubt the lesson on some questions although the llesson was on point. I consider this a pretty good presentation, but the format could have been improved. Very good test to take. Very descriptive. It was very interesting module and I learned a lot. I think these lessons are very long but informational. I was slightly confused on what was asked, until I saw the answer. It all made sense then and I grasped the training point. this is terrible course. I'm not sure why I need to know all this information at all? It was a great tool to earned a fast and basic knowledge. It is good lesson training, because people don't when it going to happen to you and your familiy. In special when you live in tropical island. This course is written for emergency managers with an INTERMEDIATE knowledge in meteorology and weather science and a basic knowledge of hurricane structure and weather service products. It is not written for the rookie EM. Great course for those new to Hurricane Planning activities. There are many pages and a great deal of information contained in the lessons. Be prepared to spend time on this course. I found the program to be very informative and effective in understanding how to utilize the information. Helpful in the planning of Hurricanes and Typhoons. This is a really good presentation. I work on the 911 side of our EM/911 group for the county. It is very good to see how our EOC operates living in a coastal community. I think that the definitions of the different products is good, but a better job could be done in contrasting them, perhaps through tabular format. This is a really great intro to safety and planning! Has a lot of good information, I would recommend this module to anyone interested in hurricane preparedness. The whole program is great. The Decision Making module is excellent- it makes you feel like you are in the hurricane event and making the decisions . . . I would highly recommend this lesson to other safety focals. The section where you make the decisions for the county using the format tools was informative and interesting. This was really a great and informative lesson. I really enjoyed it! this is on the job training, as well as educational learning for me. I've never known half the things I learned in this lesson. It is highly recommended if you live on the cost.